It’s a frantic first-person account of losing a sibling in a terrorist attack. The Loss Levels isn't beautiful or challenging, competitive or replayable. It isn't even fun... But where other games inject you into an entirely fictional world, The Loss Levels plants you firmly in this one. Specifically, it puts the player in the aftermath of the Manchester Arena bombing last year, and tells the personal story of developer Dan Hett, who lost his brother in the terror attack that claimed 23 lives, including that of the bomber. Hett's roots are in gaming, though he describes himself as a creative technologist straddling the line between programmer and artist. He runs game jams in Manchester and won a BAFTA in 2015 for his work at the BBC developing interactive children's games. He has since gone freelance to work on more experimental projects, including several games that deal with his personal experiences. "When everything happened with the attack last year, games ended up being my knee-jerk outlet," he told me. "My trajectory as a person and as a maker changed, and as such my games started to reflect that." His first conduit was c ya laterrrr, a sprawling text adventure set immediately after the bombing. You make every minute choice, from when to sleep to reading texts and social media posts on a smartphone-esque interface. There's a single end point, but many ways to get there. It explores countless what-ifs, but buried somewhere in that decision tree are the real choices Hett made and the actions he took. In many ways, The Loss Levels is a reimagining of c ya laterrrr. It tries to capture the sentiment of the verbose text adventure and distill it into a much simpler form, the result being a fast-paced 8-bit title comprising 15 mini-games. "The reason I chose that format was that part of the aim of the project was to express that this wasn't one big experience; it was actually many, many tiny experiences that I was kinda forced through at high speed," Hett said. Hett decided to create the game in PICO-8, a virtual 8-bit console. "This classic 8-bit flavor felt like an appropriate thing," he told me, partly because the project was about making something complex as simple as possible. It offers only limited colors and sounds, and the restricted file size is why The Loss Levels includes only 15 mini-games of the 40-odd he had designs for. "I have always felt that restriction breeds creativity," Hett said, adding, "You don't have time to pontificate about tech or whatever. It's just raw and you get it out." The Loss Levels debuted at the London Games Festival last week. The event hosts many polished titles, but Hett's contribution was commissioned by Now Play This, a side to the festival that challenges developers to come up with experimental and creative games made specifically for the annual occasion. "I did the sensible thing and spent every penny on the arcade cab and then built the game for nothing, really," Hett told me. It was important for Hett that people experience The Loss Levels on a real arcade cabinet, complete with joystick and just one action button. "The idea was to challenge what people expect of an arcade," he said. While the soothing 8-bit art style and familiar bleeps and bloops might tempt you in, there are no alien spaceships to shoot, ghosts to gobble up or high scores to beat after you press the start button. It's fast-paced and intense, but not in the way you might expect. "Thematically, you get an experience that is completely removed from what you would anticipate this kind of thing to be" is how Hett describes it. That's because the mini-games, each roughly 10 seconds long, recount the many distressing events he personally experienced following his brother's death. In one, you rapidly tap the action button to move between devices as you scour the internet for news. In another, you swerve through traffic in a police car as it speeds back to the station with you in the back. You drink, you visit the attack site, carry his coffin, pack his things and, finally, spread his ashes. As I said, it's not fun. The most troubling aspect of the game, though, is that you are completely powerless as a player. You make your way through each level, but anything you do or don't do has no impact on the story. It always ends the same. Hett is working on other games that approach the incident from different angles. Sorry to bother you, currently in the final stages of development, is in a similar vein to c ya laterrrr. The player will get an idea of what it's like to be inundated with messages of condolence, and will have to identify those that are actually thinly veiled interview requests. Though anonymized, the messages in the game are real, giving the player insight into Hett's experiences with the media after the attack. Over the next year or so, he also hopes to work on a much bigger project, Closed Hands, should he get funding from Arts Council England and a planned Kickstarter. The game will have mechanics similar to indie title Orwell, in that the player will interact with fictional desktop PC interfaces like email inboxes. It'll trace a much more elaborate narrative that strays from his personal viewpoint. The game will explore the different perspectives of everyone involved in something like the Manchester Arena attack, and how completely unconnected people can, in an instant, become caught up in the same tragedy. You can play The Loss Levels and c ya laterrrr in your browser here. 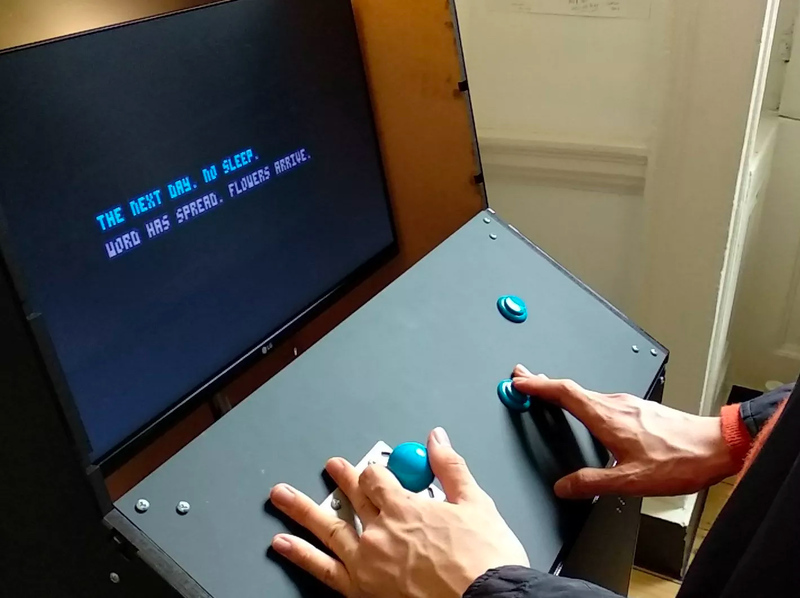 The Loss Levels arcade cabinet will also be playable at the Sheffield Doc/Fest in June, and possibly other events in the future.